Supermarket bananas could soon be coated with a substance derived from seafood to keep them fresh for longer. 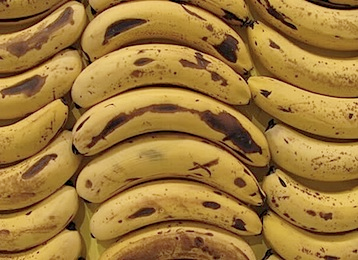 Scientists have created a special film that stops bananas breathing and also kills bacteria found on their surface, which otherwise causes them to over-ripen and rot. “We found that by spraying green bananas with a chitosan aerogel we can keep bananas fresh for up to 12 days,” said study leader Dr. Xihong Li from Tianjin University of Science and Technology in China. “Once bananas begin to mature, they quickly become yellow and soft, and then they rot. “We have developed a way to keep bananas green for a longer time and inhibit the rapid ripening that occurs. All fruit and vegetables are alive and breathe through their skin but, unlike other varieties, bananas keep breathing once they are picked and actually release a chemical that allows them to take in more oxygen. This process of respiration speeds up over time, causing bananas to become mushy. These conditions allow surface bacteria to thrive, which ultimately makes them rot. But the scientists showed that covering the bananas with chitosan kept them fresh for longer, by slowing down respiration and killing the bacteria that causes rotting. Chitosan is also being investigated for use on other fruits and vegetables, and growers hope it will be a low-cost solution to food going to waste. But first the team need to tinker with the recipe before the product can be rolled out, as one of the current ingredients cannot currently be used commercially. The research was presented at the annual meeting of the American Chemical Society in Philadelphia.